iMfolozi Game Reserve, region of the Tsetse fly research station, White Umfolozi River, 1931. Iziko South African Museum, outside the display of the entomologist’s office. 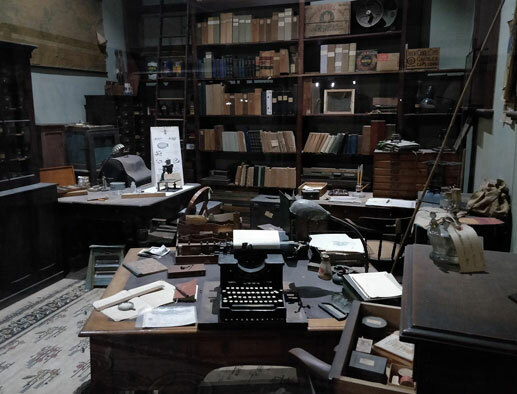 •	The reconstructed display of the entomologist Dr AJ Hesse’s office at Iziko South African Museum, Cape Town includes a cabinet of flies caught by a Harris Trap in the iMfolozi Game Reserve, 1931. 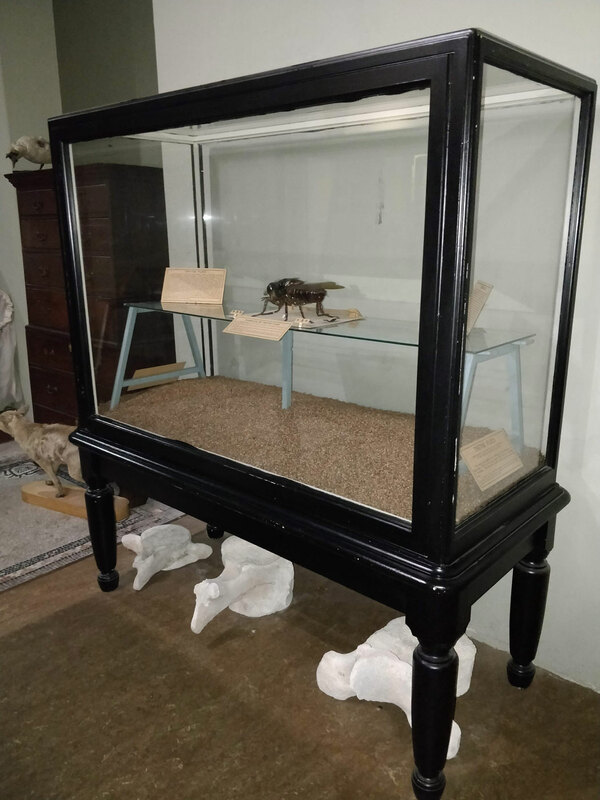 •	The cabinet has been on display in the entomology section of Iziko South African Museum since the early 1930s. Smaller fly specimens from across the African tropics are also included. Case and model manufacturers unknown. This antiquated display of thousands of deceased flies belies one of the most significant challenges to Western medicine and colonial settlement in nineteenth and twentieth-century Africa. 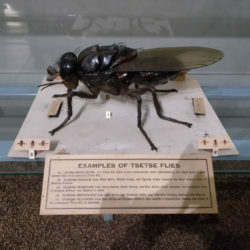 These tsetse-flies rendered settlement in many parts of tropical and subtropical Africa impossible, and caused the deaths of thousands of humans and animals alike. 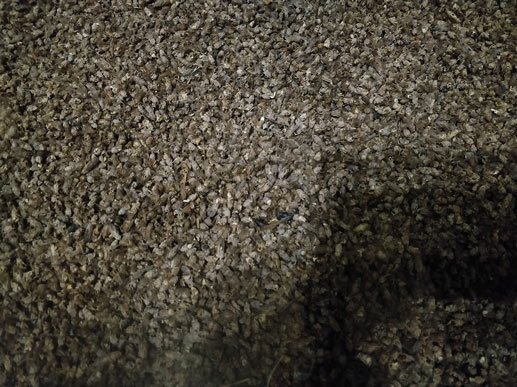 These thousands of tiny blood-sucking insects heaped on top of each other, the tsetse-flies (glossina pallidipes), were a near-insurmountable barrier to European colonialism in Africa, and a harbinger of death across the continent’s tropics and subtropics. Where swarms of tsetse could be seen, livestock or human deaths almost inevitably followed. Until the late nineteenth-century, European scientists were perplexed: what about these insects caused such devastating mortality? Was the fly venomous? Was its presence a symptom of unhealthy environments? Or was its chief source of food — big-game — the root of the problem? In the 1840s, a southern African community whom doctor and explorer David Livingstone called ‘the Bayeye’ informed him that the insect was poisonous. Its bite, they thought, contained venom toxic to livestock, but not to humans and wild animals. Livingstone conducted a series of autopsies on his ‘fly-struck’ oxen, which he believed confirmed this theory. Subsequently, the famous doctor prescribed an unusual remedy: continue trading rifles to Africans, which would allow them to exterminate big game – the chief source of tsetse-food – and starve the insects to extinction. 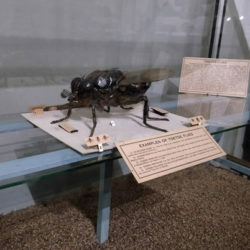 Zulu pastoralists in Ubombo and Mkuzi in the late nineteenth-century likewise saw the insect as a harbinger of disease, intimately connected to the presence of wild animals. Many Zulu inyanga believed that the saliva of big game contaminated waterholes with a cattle disease – uNakane. Cattle that drank this water became infected with the disease, to which there was no effective cure. Since flies were almost always associated with big game, the sharp pain of a fly-proboscis penetrating the skin was a sign that disease was nearby, and cattle needed to be moved, or wild animals driven away. Others were able to utilize the insect to their advantage, in what Clapperton Mavhunga calls “strategic deployment”. The Balobedu reportedly utilized the fly as a biological weapon against Boer raiders and warmongers. The Second Rain Queen, by the account of amateur ethnographer BH Dicke, had constructed her settlement atop a peak surrounded by a tsetse-infested fly-belt on all sides. When the Boers came to assault her kingdom between the 1850s-1870s, she stalled their onslaught within the belt until their oxen and horses began to die. At this very moment, she reportedly emerged from a mist and the sound of her cackling reverberated across the mountains. The Boers, fearing the supernatural, turned tail and fled to the Transvaal. For European colonists, the fly was a disaster. Its presence rendered agriculture nigh impossible in the tropics, and throughout the nineteenth-century, it was deemed largely uncontrollable. The fly effectively protected thousands of kilometers of tropical forests and bushveld from the onslaught of colonialism. In 1881, famous big-game hunter Frederick Selous, called the flies the “most abominable of all created insects – direct descendants, no doubt, of the flies that plagued Egypt” in Biblical times. In the 1890s, with the growth of bacteriology and tropical medicine came new optimism that the insect could be controlled. From 1893-1903, an extensive series of laboratory experiments were conducted by Scottish surgeon-major David Bruce, and research-partner and wife Mary Bruce at Ubombo, Zululand. At a cost of the lives of more than four-hundred dogs, and many wild animals, the Bruces proved to European scientists what many Africans had already known: that the fly was toxic to domestic animals. Harboured in the blood of big-game, and harmless to their hosts, were minute blood-parasites known as trypanosomes. 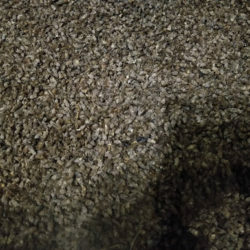 These parasites were transmitted from wild to domestic animal through the proboscis of the blood-sucking tsetse-fly. In most livestock, these organisms multiplied uncontrollably, eventually sending their hosts into an eternal sleep. European scientists named the disease trypanosomiasis, or commonly ‘nagana’ in animals (a corruption of uNakane), and in humans, sleeping sickness. For this work, Bruce received fellowship of the Royal Society, and later a knighthood. 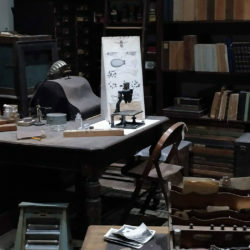 His wife Mary Bruce only received credit as a lab-assistant and his Zulu informants and labourers, whose knowledge formed the basis of his investigation, were not credited at all. In his final days, Bruce announced that his wife had been a research-partner in all his endeavours, and that he could have accomplished nothing without her. Heartbroken, he died midway through her funeral in 1931. 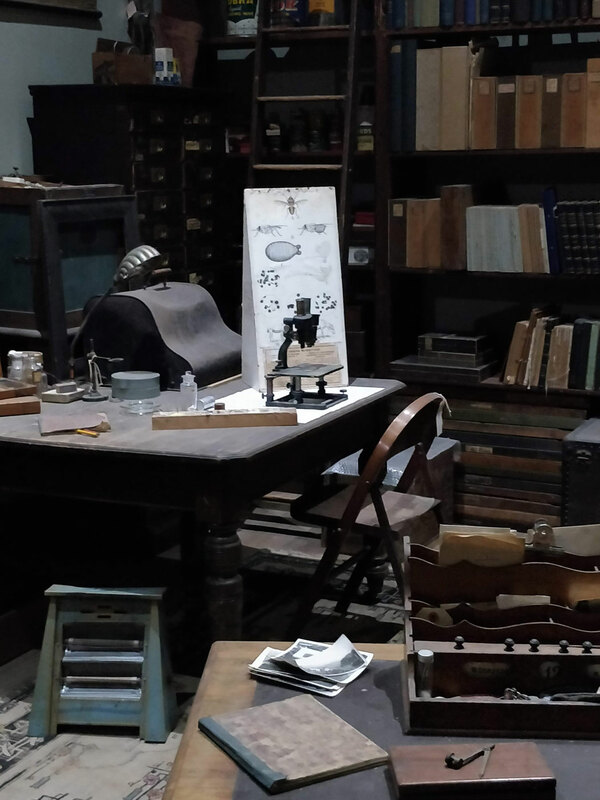 Despite the Bruces’ celebrated discovery, no vaccine, or effective cure could be found until the 1920s. Instead, colonists across much of Africa turned their guns onto the big game – in an attempt to eliminate the so-called reservoir of disease. In South Africa, this policy claimed the lives of more than 30 000 wild animals in Zululand alone, and was met with complete disaster. The deafening booms of rifle-fire terrified animals only scattered them into new areas, and spread the disease. In 1931, there was newfound optimism that the problem could be resolved. Quirky and untrained entomologist, RHTP Harris, who had spent a decade making painstaking observations and executing complicated experiments in the iMfolozi Game Reserve, felt he had found a solution. 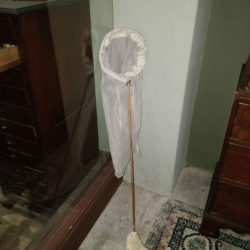 He patented a fly-trap which resembled the belly of a bovine animal, and tricked the insect into thinking it was about to get a tasty-meal, only to imprison it in a hessian net. These traps were distributed across tsetse-areas in southern Africa, and claimed the lives of millions of insects. 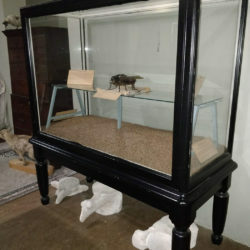 This case, located adjacent to the entomologist’s office in the South African Museum, and commissioned by Dr AJ Hesse in 1932, is modelled to resemble a Harris Fly Trap. The thousands of flies heaped within it were caught in the iMfolozi Game Reserve in September, 1931. As its labels make clear, even this spectacle of extermination was dismissed as a comparatively small collection, the previous month’s catch being twice as large. 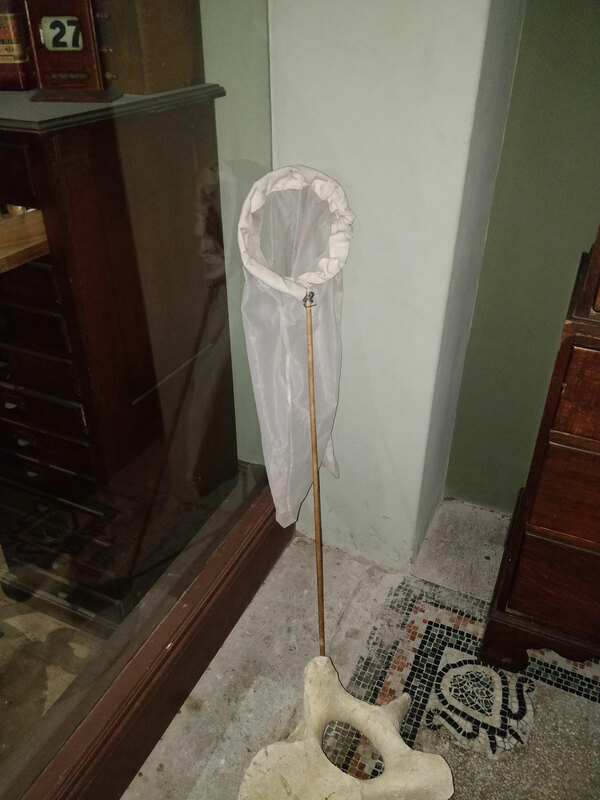 Such traps, the curator thought, would drive the insect to extinction: Harris had supposedly “so far reduced the fly population that nagana has nearly disappeared from the area that he has worked”. Above it, sits a scale-model of the fly, and a collection of fly-specimens from across Africa. This model, standing atop the mountain of flies, like an explorer’s flag, illustrates how entomology and bionomics had enabled scientists to enter the mind of the fly, and control it by manipulating its ‘natural’ behaviour. The case is both a triumphant declaration of conquest over a hostile pest, and a grotesque exposé of the spoils of war. 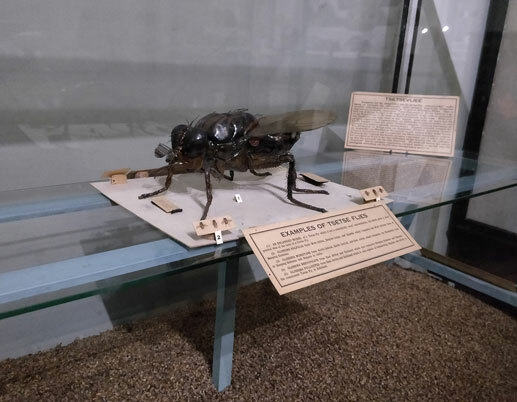 The unfathomable and uncountable numbers of flies in the case seeks to communicate the scale of the fly-’infestation’: millions of these insects once existed in Zululand. Now, a union of natural history, ecology, and practical technology had rendered the insect almost extinct. This was celebrated in mass-media as an immense victory, showing how science had finally solved a seven-thousand-year-old African problem, and transformed a region once inhospitable to settlers into a series of fertile lands to plunder and develop. The hubris of such assumptions was soon revealed, as nagana continued to plague farmers in Zululand throughout the 1930s. Only in the 1950s, would the deadly, cancer-causing pesticide DDT deal the coup-de-grace to the Zululand tsetse-flies. Millions of other insects and small animals were likely caught in the crossfire. We will perhaps never know what biodiversity was lost to this destructive and rash action. The case now stands as a commemoration of this early (if premature) victory against the fly, and an awkward monument to science in service of colonialism. If not caught in a Harris fly-trap, these flies might have flown anywhere from the White Umfolozi River in the south, to the Usula River in the north. See Toppin’s Map of the ‘Probably Limits of Glossina’, from 1928. 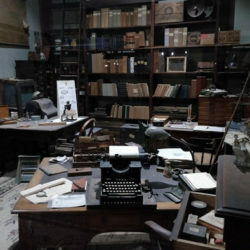 South African Museum, entomologist’s office (since c1932). Brooks, Shirley. 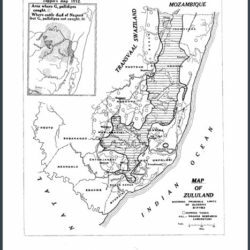 “Changing Nature: A Critical Historical Geography of the Umfolozi and Hluhluwe Game Reserves, Zululand, 1887 to 1947.” PhD Thesis, Queen’s University, 2001. Brown, Karen. 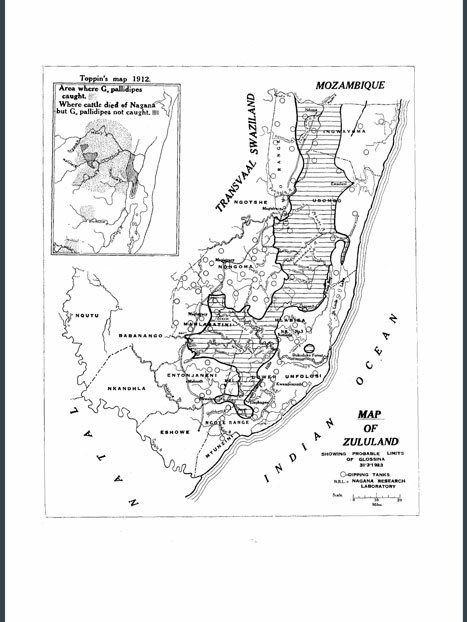 “From Ubombo to Mkhuzi: Disease, Colonial Science, and the Control of Nagana (Livestock Trypanosomosis) in Zululand, South Africa, c. 1894–1953.” Journal of the History of Medicine and Allied Sciences 63, no. 3 (July 1, 2008): 285–322. https://doi.org/10.1093/jhmas/jrn003. Bruce, David. Further Report on the Tsetse Fly Disease or Nagana in Zululand. Durban: Bennet & Davis Printers, 1896. Bruce, David. Preliminary Report on the Tsetse Fly Disease or Nagana, in Zululand. Durban: Bennet & Davis Printers, 1895. Bruce, David. “The Croonian Lectures ON TRYPANOSOMES: CAUSING DISEASE IN MAN AND DOMESTIC ANIMALS IN CENTRAL AFRICA.” The Lancet 186, no. 4793 (1915): 55–63. https://doi.org/10.1016/S0140-6736(00)80784-9. Dicke, Bernard Heinrich. The Bush Speaks: Border Life in Old Transvaal. Pietermaritzburg: Shuter & Shooter, 1936. Harris, R. H. T. P. Report on the Bionomics of the Tsetse Fly (Glossina Pallidipes Aust.) and a Preliminary Report on a New Method of Control, presented to the Provincial Administration of Natal. Pietermaritzburg : Natal Witness Ltd., Printers., 1930. Harris, R.H.T.P. “Tsetse Fly Investigations in Zululand.” Union of South Africa Department of Agriculture Scientific Bulletin, no. 62 (1927): 1–19. Livingstone, David. Missionary Travels and Researches in South Africa. London: John Murray, 1857. Mavhunga, Clapperton. “Big Game Hunters, Bacteriologists, and Tsetse Fly Entomology in Colonial Southeast Africa: The Selous-Austen Debate Revisited, 1905-1940s.” Icon 12 (2006): 75–117. Mavhunga, Clapperton. 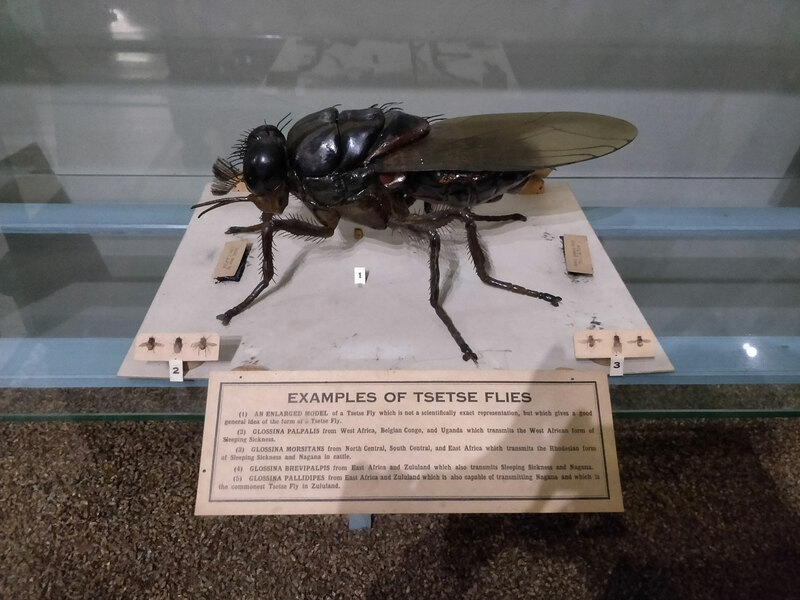 The Mobile Workshop: The Tsetse Fly and African Knowledge Production. Boston: MIT Press, 2018. Selous, Frederick. A Hunter’s Wanderings in Africa. Fifth edition. London: Macmillan and Co, 1907. Tilley, Helen. Africa as a Living Laboratory : Empire, Development, and the Problem of Scientific Knowledge, 1870-1950. Chicago: University of Chicago Press, 2011. Tilley, Helen. “Ecologies of Complexity: Tropical Environments, African Trypanosomiasis, and the Science of Disease Control in British Colonial Africa, 1900-1940.” Osiris, 2, 19 (2004): 21–38. All photographs for this entry taken by Jules Skotnes-Brown, in August 2018.